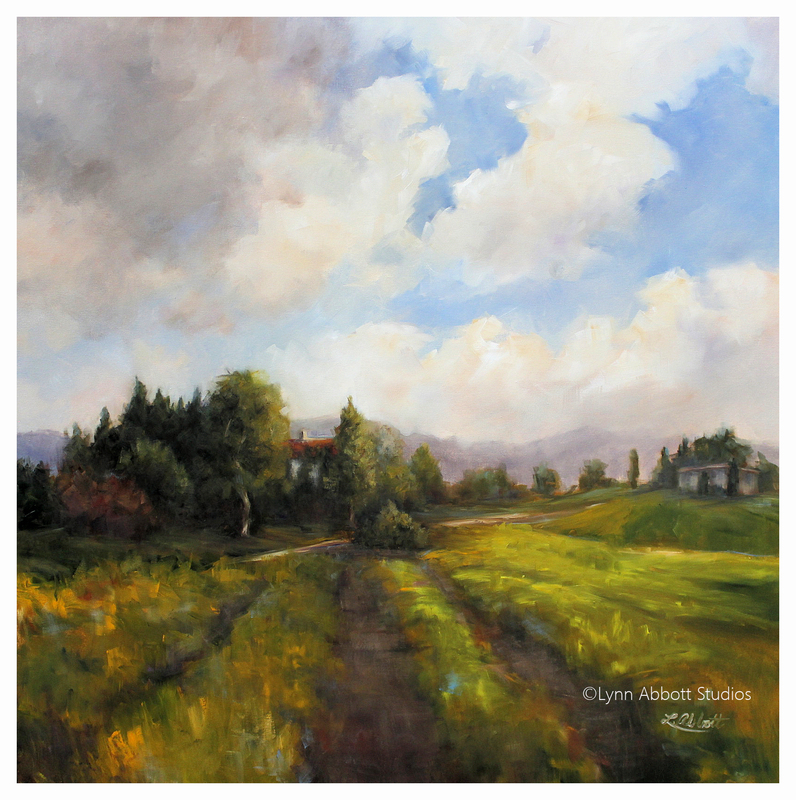 Ascending Clouds: the Study and Final Painting, © Lynn Abbott Studios. Used with Permission. “How about a bow tie,” the boutique salesman asked, flashing me a wide grin. I looked at my over 6-foot, history-loving, educationally ambitious son. My mouth twitched as I stifled a laugh that threatened the dignified persona that I hoped to present in that fine men’s clothing boutique. Noting his confusion, I knew I must tell the story in its entirety. If you know me well, you have often heard me say that when God called my father home, God sent my father’s grandson to fill the space. Obviously, God did not wish to leave this world without a representative of my father’s kind. I can offer no other explanation for the extraordinary similarities… With my son’s first cry, I knew I was in trouble. The “professor” had arrived. And he knew best how to teach the rest of us. Our parenting challenge began immediately. Our newborn had a mind of his own and refused to follow textbook feeding. Undoubtedly, My attending nurse thought me inept. Apparently, as a first time mom, I must be in desperate need of a review lesson. But after exhausting her expertise in an effort to direct my strong-minded newborn, she abandoned us. “You’ll figure it out,” she called with a decided tone of exasperation. And I’ve been scrambling ever since. The man child “knew best”… just like my father. And similarly, from an early age, the child confidently communicated his ideas. When he was just 12 months, I found him lecturing his stuffed animals. In fact, one of those plush critters had been placed in a corner. Had there been a dunce cap available, I’m sure my son would have placed it on that unfortunate toy’s head. When it came time to teach table manners, I swiftly discovered that the boy not only learned quickly but that he was eager to impart his knowledge to anyone within earshot. That’s right. Although he was a mere tot, he fully intended to lead and teach. No need to encourage him–as Paul did Timothy–to use his gifts (1 Timothy 4:12). For 22 years, he’s kept us on our toes. Of course, this walking encyclopedia has unique gifts. He will be a historian whereas my father was an oceanographer-geologist. But our son nevertheless exhibits many of Dad’s traits without ever having been encouraged or prompted to do so. And so you now fully understand my reluctance during that Christmas shopping excursion. Given the already uncanny resemblance between grandfather and grandson, the bow tie was obviously an unnecessary accoutrement . After all, the mantle had already been passed. In light of this, I couldn’t help but grin recently as I renewed my study in 2 Kings. The histories of Elijah and Elisha brought to mind the connection between my father and his grandson. and not only that, but Elijah also mentored Elisha. It’s a spiritual father and son story that begins in 1 Kings 19. Elijah had exhausted his strength during the confrontation of Baal’s prophets on Mount Carmel. But God didn’t leave Elijah in such a state. In addition to providing for Elijah’s physical needs, Abba tenderly encouraged His prophet and provided an assistant. Yes, God understands our needs: He created Eve for Adam; He provided leaders and judges to assist Moses. And He gave Elijah an Elisha. When Elijah found Elisha, he threw his cloak or mantle over Elisha’s shoulders (1 King 19:19). Elisha understood the significance of the prophet’s actions: Elisha had been chosen for discipleship. Thus, Elisha immediately requested permission to bid adieu to his parents. So began Elisha’s apprenticeship. Most Bible scholars suggest that Elisha’s studies started while he was still in his twenties and that Elisha served the elder prophet anywhere from four to eight years. Although Scripture doesn’t describe those years, I suspect Elisha received some pretty serious instruction. Elijah, after all, was an earnest fellow. And to spend 24/7 with him? That had to be pretty intense. The mantle has already been passed. We pick up Elisha’s story as Elijah’s career closes, (2 Kings 2). Apparently, all the prophets knew Elijah’s departure date. Elisha, then, was not likely surprised by Elijah’s intention to travel to the Jordan. Three times during the journey, Elijah encouraged Elisha to remain behind. 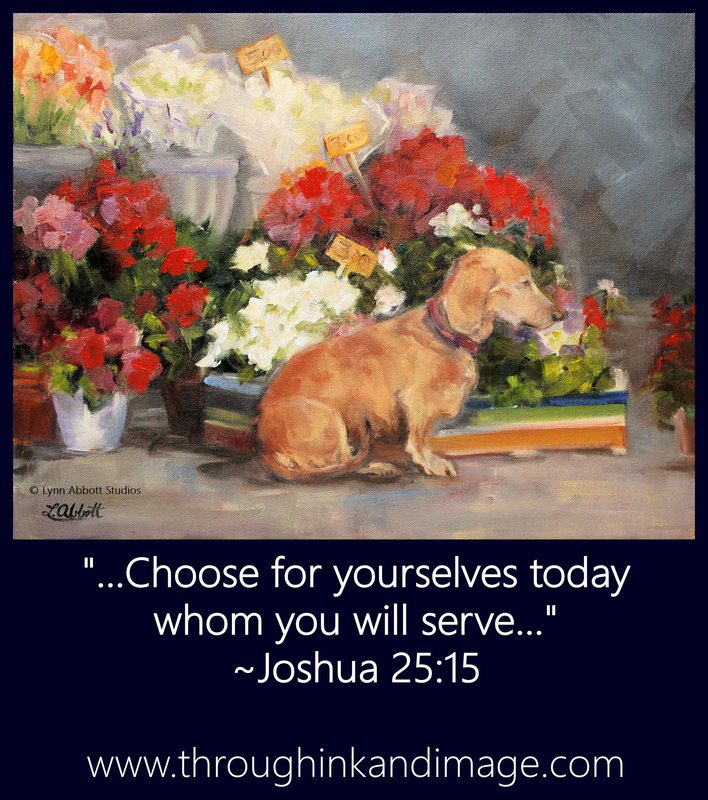 Perhaps, in this way, Elijah sought to test Elisha’s loyalty and love. But Elisha refused to abandon Elijah (2 Kings 2:2). “The company of the prophets at Bethel came out to Elisha and asked, ‘Do you know that the LORD is going to take your master from you today?’ ‘Yes, I know,’ Elisha replied, ‘but do not speak of it,'” (2 Kings 2:3). When the two men–spiritual father and son–arrived at the Jordan, Elijah used his cloak to part the waters. Then, he asked what he might do for Elisha. Elisha simply wanted God’s Spirit to empower him as God had empowered Elijah. Suddenly, a chariot and horses of fire separated the companions. And Elijah traveled heavenward in a whirlwind. Elisha’s heart broke, (2 King 2:12). Yet, God never leaves the world without revelation. And God had not abandoned Elisha or God’s people. Despite his heartache, the young prophet picked up Elijah’s cloak, and before touching the cloak to the waters of the Jordan, he glorified God, saying, “‘Where now is the LORD, the God of Elijah? '” (2 Kings 2:14). And the Jordan parted; Elisha walked on dry land. God never leaves the world without revelation. Second Kings records many of Elisha’s miracles. Many of those miracles mirrored those performed by Elijah. Yet, Elisha was definitely his own man. Unlike Elijah, Elisha did not work solo. Instead, he spent much of his time leading and discipling the company of prophets. Yes, I truly love the story of the prophet and his spiritual son. But as I reread the account of Elijah’s departure, I couldn’t help but recall another ascension by One even greater than Elijah, (Matthew 17:1-13; John 1:24-27). After the resurrection, our Savior commissioned his disciples–present and future–with the preaching of the gospel: salvation by grace through faith in Christ (Matthew 28:18-20). And like the Master, we minister to people’s physical and spiritual needs. We model His love and grace. We teach others to obey and follow Christ. Our name–Christian– identifies us as His followers. Our name is similar yet different. Of course, our journey isn’t identical to the Master’s. But we do serve as His representatives, and we boldly carry out the Great Commission. Never mind Dad’s bow tie. When we follow Christ, we receive something greater. Yup. It’s time to pick up His mantle, (Luke 9:23). This was lovely to read, Lynn! I loved learning more about Elijah and Elisha (I won’t deny it, I’ll mix them up in my head too, haha), and I think it’s absolutely endearing when resemblances can be seen among family members. (Unless, however, the traits are not likeable, lol!) The Lord certainly does have a sense of humor 🙂 ❤ Thank you so much for sharing! Yes! But even when the traits aren’t likeable, it actually makes me giggle a little when I see them. 😉 I suspect you do, too, Maggie. You are such a fun, kind and gracious person. Thank you for your very thoughtful comments here… and do I see a new little sibling pictured with you in your Avatar?? Woo Hoo! Hopping over to your blog to catch up on your news! ❤ and huge hugs! something greater! yes and amen! Loved this post!!! Hope you have a good day!!! Thank you so very much! I’m delighted to meet you! Looking forward to visiting your place. God bless you greatly! It’s just like the father of the prodigal son. Christ wraps up in His hug ready to love and teach us. How incredible that your son carried so many traits of his grandfather 🙂 God is good. 🙂 thank you so much, Lynn!!! I love how we can share our love for Christ and how He draws us closer together, and strengthens us. Vincent, how can I ever thank you enough or repay such kindness? You are truly an incredible blessing to so many of us here in the blogging world! I am very grateful to you. May God bless you beyond all that you can imagine! Ahh, this was a really sweet post! Well done.Loved hearing about your son. Thank you for telling the story of the bow tie and Elijah. Picking up the mantle, indeed. Thank you, dear IB! I am truly honored that you would take the time to read here… and all the more that you would leave such a kind and thoughtful comment! Thank you with all my heart! God bless you beyond all that you can imagine! Thank you so very much, Warren! I feel exactly the same about your wonderful blog! It is an ongoing encouragement to me. God bless you greatly. I always learn from your posts Lynn, thank you! Blessings! Oh, my… I am truly honored that you should learn anything from my posts, Bruce. Sending you a huge thank you! Your blog is such a wealth of wisdom and deep truth for me! I am so grateful to have discovered you and your blog. God bless you greatly, Bruce! You’ve done it again Lynn. Love the way you take a story about life and relate it to scripture. Such a wonderful gift. I have done a few such posts years ago and should bring them back as reprint with a lot of new readers. You inspire me! Thank you, Pete, with all my heart! You are truly an encouragement and inspiration to me. I’m grateful if anything I write can encourage or inspire you… I am truly honored by your words! I would love to read your posts! I’ll look forward to that whenever it will be. God bless you greatly, my super talented friend! I’ll have to dig them up and run one every so often. You are an encouragement to me a well. This WordPress family is so great! Yes, indeed! Truly a gift from God! And I’ll look forward to reading your older posts when you run them! Have a fantastic week, Pete! Dear Lynn, I confirm a truth you know: you are a daughter of the Most High God; you dwell in the center of God’s will; you have a prophetic artistic poetic anointing of a true worshiper; you have paid the price for love; you have the right to speak as an ambassador of Christ; you are a godly wife and mother with a ministry sealed by heaven; the words of your mouth and the work of your hands shall touch many, all over the world; your son is a royal seed and he is blessed! Oh, Lia… You have blessed me beyond my ability to express!!!!! God led you here to confirm this. 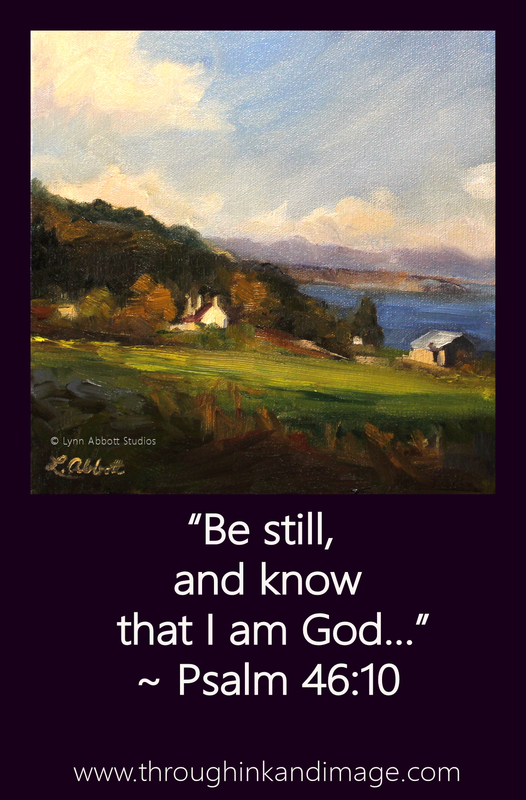 Like Elijah, I have been very tired as of late… and began to question my physical ability to keep up with my calling even though I know full well, that when I am weak, He is strong. As a result, I have been taking those thoughts captive and raising the shield of faith a great deal as of late to fend off the fiery darts of doubt that the enemy wished to plant. You and your words here today are the answer to my heart cry to Abba for direction as well as confirmation that I was still walking in His will. Thank you; thank you for your close walk and communion with Him, and for coming here to share His word for me this day. You are a huge blessing to me! May our heavenly Father bless you beyond all imagination for your faithfulness to Him!! Love and Grateful Hugs! Oh, Lia… God bless you again and again! I truly treasure your friendship! You are truly anointed by God! I am currently recovering from 11 years of cancer therapy. I just completed my final medications this past month… and so I suspect that this is the cause of the exhaustion/weariness that you note here. I am feeling better and better every day, but as you well know as a medical doctor, eleven years of cancer treatment and preventative medications takes its toll. One of the side-effects of the medications was insomnia… and thus, I have functioned for years on only about 3-4 hours of sleep per night. Needless to say, it is such a gift to now be able to sleep again. But I’m sure it will take more than just a few nights to catch up on eleven years of sleep deprivation. 🙂 So I am making a big effort to give myself grace and to trust God to give me complete rest and recovery now that the medical treatments are over. Thank you for your kindness to me! You are a gem. God bless you greatly! ❤ and hugs to you, my sister in the Lord! This is a long lonely hard road… I am so happy that you have crossed over to the other side… You can celebrate now…. how do you want to make yourself happy? Tell me so that we rejoice together… Glory to God! Thank God for your healing! May you live a long and fruitful life! Be a blessing to many! Worship the Lord! God bless your family! We like traveling too… I thank God for ‘meeting’ you in the Spirit… I feel as we have known each other since childhood… I love the way you open up, your spirit is gentle, willing and available… God bless you with the blessings of Christ, dear sister and friend! May tomorrow be extra special for you! In Jesus name, amen! And I feel the same, dear Lia. Thank your for your loving-kindness, grace and encouragement! I truly treasure your friendship. May God bless you beyond all that you can ask or imagine!! ❤ and hugs! Amen Lynn. I absolutely love this post. The fact that your son was already “teaching” is amazing to hear. Along with the fact that he resembles some of your father’s aspects, it’s nice to see. When we follow Christ, we receive the Holy Spirit in return. Yeah… pretty funny that he started “teaching” almost immediately. Thank you, Josh for your kind encouragement! It means the world to me coming from a Bible scholar like yourself! And yes! Just as Elisha wanted a double portion of God’s Spirit, when we receive Christ, we receive the Holy Spirit… just as you have so astutely noted! Thank you for pinpointing that in my post’s theme! You’re fantastic! God bless you big time, Joshua! This reminds me so much of Brenton and his “Pops”—they were two peas in a pod—partners in crime up to Dad’s last day. Not the teaching types–more like the delinquent types—as dad would opt for things he shouldn’t be doing or eating or drinking and his grandson being his biggest enabler. Dad didn’t wear a bow tie—except way back in the day when the big ones had come in style—but Brenton wears them to this day. Dad had gone to Tech and Brenton loved UGA, where I had gone. A true in-state rivalry– but when Brenton was in college he took ROTC through Tech because his school didn’t offer a program… so he did a dual enrollment. Oh, I love this, dear Julie! You totally “get” this, then! I can imagine the wonderful mischief that your Dad and son conspired to make!! Love it. And love the fact that Brenton wears bow ties. My dad wore the small bow ties and skinny ties. Saved some of those and Matt can really sport the skinny ties well! 😉 How awesome that Brenton is proud to be connected to the same University that your dad was. Matt wants to do his Ph.D. at UVA since I’m an alumni. I think the Chicago winters make the University of Chicago (dad’s alma mater) less appealing. 😉 Thank you for sharing your wonderful stories with me, dear Julie! God has truly given me a treasure in your friendship! ❤ and hugs! Brenton likes the little bow ties…his dad not so much. I think I told you about the time when Dad had taken us to Rome—my step mother, aunt and I had all gone to do or see something so dad gets Brenton and off the go to a little pizzaria close to the hotel where dad proceeds to drink an entire carafe of wine by himself….Brenton was all of 13. Brenton has to usher Pops back to the hotel and get him situated and had to swear an oath that he’d not tell us what dad had done—dad wasn’t use to drinking Italian style…and had to go on to bed. They were definitly partners in crime…. Amen Lynn-.probably why my emails are few and far between as I really have too much to share with you!!! Yes, it would indeed, Jeff! Thank you; thank you!! And thank you for your wonderful encouragement. You can’t even begin to imagine how much that means to me. Just one of those weeks and God used you to really bless me today! 🙂 Thank you, my friend, with all my heart. 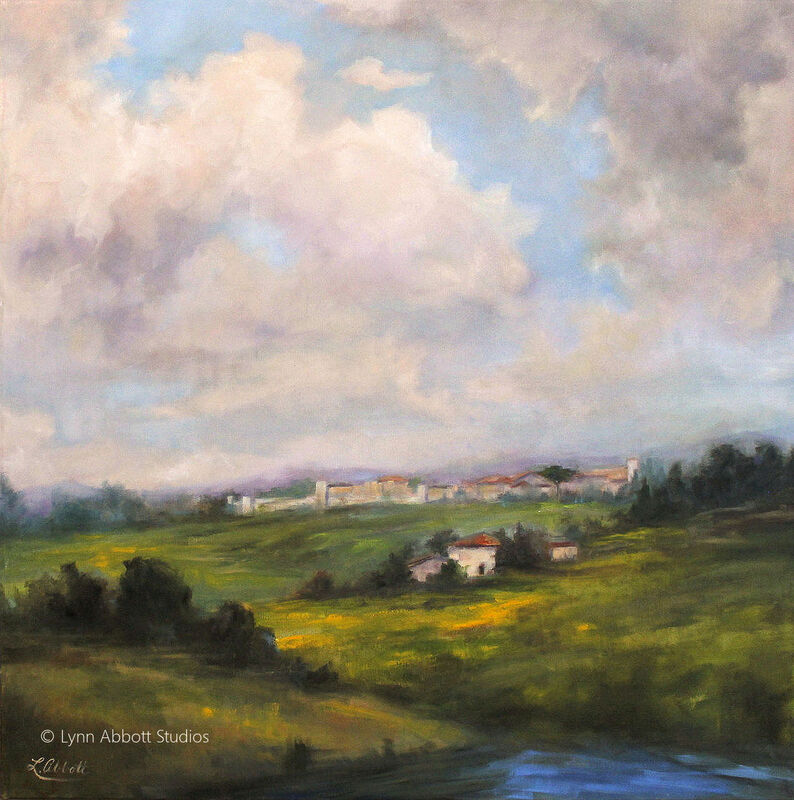 I loved this, Lynne. Our lives really do parallel. Our first grandson has followed his grandpa’s lead as well. I often referred to him as a walking encyclopedia. His brother has a great sense of humor and responded, “and I’m just a pocket dictionary / with pages missing. Both boys have inherited a love for God as well and are well equipped for life. I’m so sorry. I need to be better about checking my Spam folder! Obviously… if a dear friend’s comments end up in Spam, what is WordPress coming to? 😉 Sigh… so glad I found your comments now. ❤ and huge hugs! ❤ thank you!!! The tech support told me it hopefully shouldn't be a problem. Oh, good they are. Lynn, I loved this post. I think God sends us blessings and the personality of your son resembling his grandfather is so nice. 🙂 I feel like we are the prodigal son and Jesus throws His cloak on us in an embrace. So… T.R., you were absolutely right! I found three of your comments in my Spam folder. What in the world? There is nothing about your comments that would have any appearance of Spam! Thank you so much for this thoughtful comment! I love what you say about Jesus throwing His cloak on us in an embrace. So true! Your words beautifully depict my experience with Christ. Thank you. Love and hugs to you, my wonderful friend! Yes, at first, the comment stayed on my page, so I thought, oh good it’s working, but then when I left I didn’t see it. Yeah… how frustrating about the comments. But we’ll pray you through this! Lynn, your Dad and son sound like really great guys. I never tire of hearing your stories! Aww… thank you so much! Yes, I think Dad was pretty awesome and it’s great to see my son carry on that legacy. 🙂 Thank you with all my heart for your encouragement! It means the world to me. Amen! I smiled throughout while reading this. I love reading your stories and your son is a blessed young man. May God continue to guide him. 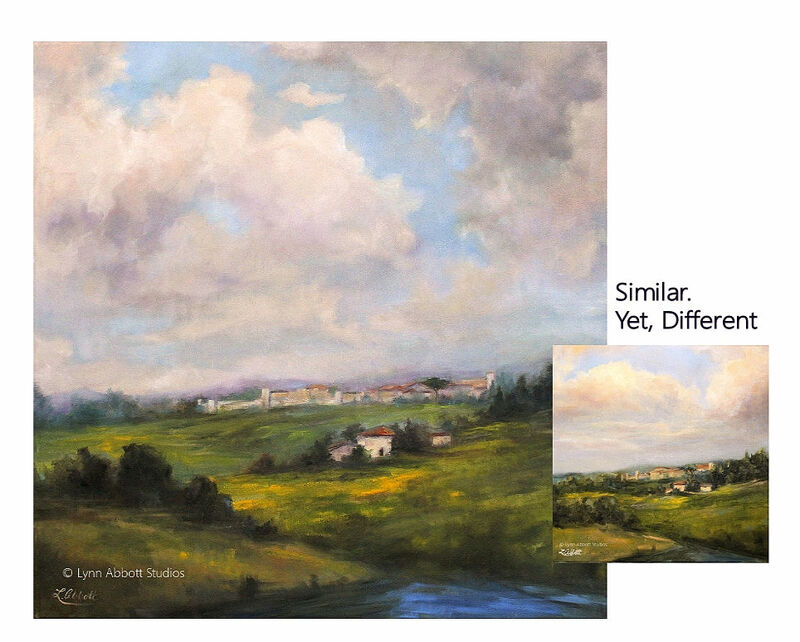 I enjoyed finding the differences in the paintings, Lynn. At first I thought it was primarily the shape of the clouds, but then I noticed how the light from the sun gave the separate paintings a different tone. 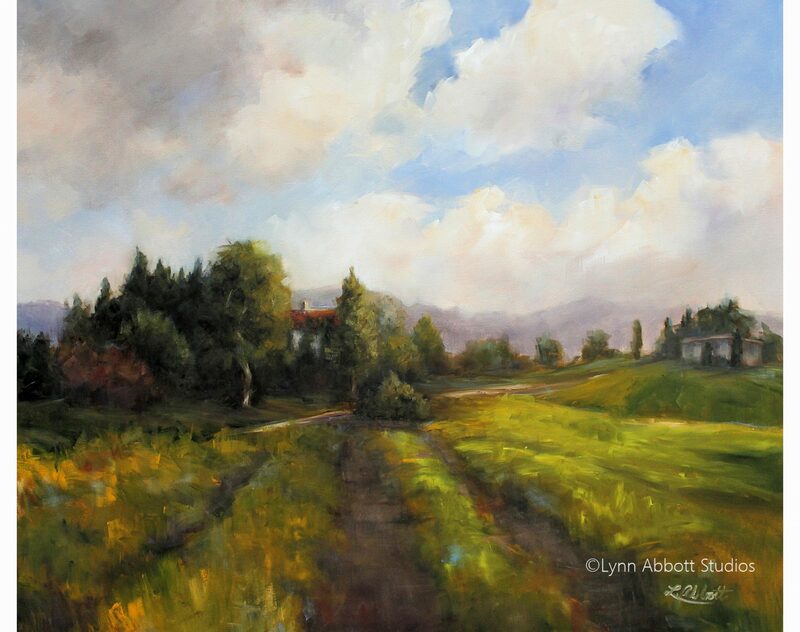 The sun in the smaller painting was casting a more golden hue on the clouds and landscape. What a fitting example of this story of your dad and son. Also of Elijah and Elisha. Alike but different. I smiled as I imagined your son at 12 months already lecturing his stuffed animals. 🙂 And yes, may we pick up Christ’s mantle! Thank you for always encouraging my heart with your lovely paintings and stories! Love and hugs to you! I love how you connected your son and dad to Elijah and Elisha, and then dovetailed that so nicely with the Lord Jesus Christ. My son Bobby is a replica of his grandpa (my dad) too, in both looks and mannerisms. I love it, especially since my dad is gone now, since I can still see him in my son. Lynn, you have a great gift of storytelling…have you ever considered writing a book of Bible stories. After all, that’s where all this began isn’t it? Yes, it is where all of this began! Thank you for noting that! That means so much to me. And thank you for your confidence in my writing and art…you encourage and inspire me greatly. And I believe that God sent you here to do exactly that! You have blessed me beyond word. Thank you, thank you. You are the encouraging one. Live large! I’m teary eyed… I really enjoyed this post. Thank you! Isn’t it amazing how that works? Often such personality qualities skip a generation. I find it so fascinating. I bet your daughter is wonderful. Thank you so much for your encouragment, Ian. Your friendship is a blessing. May God bless you greatly in the coming week! Thanks Lynn. This is an excellent article, well thought out, and with a loving relational component evoking two great loves in your life. You have made me want to delve into that ancient story in much greater detail. We know the basics and I know I will not find much more on the surface, but beyond that surface is likely a treasure trove awaiting. It was great to hear about your son and father and their similarities, and how all that we are shows up very early! Passing the torch is a common theme in Scripture but maybe one not thought of too much, especially in relation to the present, but we are at such a place. I have discovered generational change occasions which evoke the Lord doing big changes on the world or national scene, but even then such transitions are not noticed by most as the work of His hand. Suffice it to say that the baton has been handed off and the young must now more fully learn His way while going through those motions of their own and learning survival in this world. May your son walk the Lord’s path in all its fullness. Be blessed Lynn, and your whole family. Thank you so much, RJ! Your approbation means a great deal to me as I admire your writing and your thoughtful and scholarly approach to the Scripture! Thank you also for your blessing for my son and my family. It means the world to me. You are a huge encouragement to me. God bless you big time! Thanks Lynn for this endearing post…….my son too, has many common traits with his grandfather (my father). Sometimes it is just a look and both would have their left elbow on the table with their hand held up when they ate. It was uncanny for me to watch! But what I am noticing in my son the most recently, is his love for his fellow man, just like my father who always brought some poor soul to our Thanksgiving table. My son is really starting to be a “man for others” which makes me so grateful how GOD knows and does pass down those wonderful spiritual gifts from generation to generation! Beautiful words, beautiful post and thank you! Oh, my goodness, Eunice! Your kind words have blessed me more than you can possibly imagine! Thank you with all my heart! ❤ and huge hugs! This is a beautiful story! I am glad you have had such a beautiful way of sharing the developing characteristics! Blessings! Oh, Margaret… I’m so happy that you laughed! I laughed as I wrote this post… and I’m thankful that you shared the humor with me! That means the world to me. Thank you; thank you! You can’t even begin to imagine how much you have encouraged me. Thanks so much for taking the time to read and write such a thoughtful comment. You’re the best! ❤ and hugs! You always give me food for thought Lynn in the Scripture Stories you share and yes sometimes with your personal sharing you also bring back Memories too, I very much appreciated the Respect you have for your Father in recognizing his Life wisdom and it does seem your Son is not going to just accept the norm either unless he has checked it out for himself too. After finding I was Dyslectic and not Retarded and in fact I have a very high IQ at least on one side of my Brain the other is hopeless with Maths , Spelling, Writing, Technology etc there are helps and God intervenes when needed but after being told about my IQ and feeling for the first time that I was not Hopeless which others had thought too, I remember saying to my Boss when I was 15 that I was very intelligent and knew everything, he didn’t correct me but his look was saying; “Baby you’ll learn” and for someone who was so smart I made a lot of mistakes in my life and I’m still learning. But yes I do appreciate your Respect for your Father Lynn, which is something that God tells us to have for the Elderly. Leviticus 19:32 “‘Stand up in the presence of the Aged, show respect for the Elderly and revere your God. I Am The Lord.